Wow, you guys have got such a hot sense of humor. Actually, I find it very hilarious, and snide, and think that the only way it could be any better is by having a dude holding up two middle fingers and saying "F U Lamar!"... But I don't think that would fly. What would your more highly developed ventromedial frontal lobe produce? Your assumption that he has one is not necessarily valid. "Your assumption that he has one is not necessarily valid." If you mean Lamar Smith having a frontal lobe, he doesn't. He has a bill slot on the front of his head that only accepts $100 USD bills from lobbyists. Re: Where is the like button? Count Me In on that !!! Re: Re: Where is the like button? They should put an electronic "Like" counter up on it and sync it to a Facebook page. Re: Re: Re: Where is the like button? It would make the National Debt Counter look like a sundial in comparison. Will the Like button track me every time I look at it, just like the one on the Internet? The Internet: doing serious business, one meme at a time. You know things are serious when medals are getting handed out . . .
i am unable to hear the intended levels of sarcasm you intended due to the overwhelming level of awesome found in those medals. how long before Lamar Smith issues a 'take down' notice then? It's a trick question, the takedown will be from the state of Texas. ... paid for by Lamar Smith. Next step, claim Lamar's seat, and let his loss serve as a reminder to other politicians what happens when you mess with the internet. Oh, lookie. Some deluded and naive pirate gave Mike a medal. Please go do something anatomically impossible to yourself. You have yourself a nice day. Translation: I'm a big loser that has never won anything, therefore, I feel obligated to piss on everyone else's parade. Oh lookie... some deluded and naive AC supports Lamar Smith! Sounds like someone needs to call you the wambulance. Let him have his moment in the sun. The apologists are big on self-congratulations and creating meaningless forms of self-recognition. I'm sure he wears it around town like an aging Soviet WWII vet with dementia and probably wears it to bed at night as well. You know pirates, it's all about the bling. Marked as funny. But I think that might not have been your intention. Good job! I knew you'd be jealous. He is not jealous, just undergoing a slow speed mental break down. So who funds fightforthefuture.org, anyway? They found that pot of gold in the end of a rainbow. I thought the MAFIAA had stolen it to pay for hookers and blow! Big Search and Big Piracy, of course. "So who funds fightforthefuture.org, anyway?" The internet has scored.. well, +100.000 internets with this one. At the time I couldn't donate (damn international payment issues) but I'm glad we actually funded TWO billboards!!!!! I hope Lamar realizes he is toast now. Go IDF! The ClearChannel logo kind of kills it. You mean the wifi logo? Since when did ClearChannel start using that - I thought theirs was a stylized C? Argh. Nevermind. It was so tiny I didn't notice it. I'm assuming that ClearChannel is the owner of the sign. In my area, on billboards like that, there is a logo in the same spot which I know is the owner of most of the billboards in my city. The number on the lower left is the sign ID. If you want to advertise on that board, you then know who to call and also how to identify the sign to them to rent the space. And yet, some clueless jackass will blame Google for this too. Look at the bottom center of the billboard, on the support frame. Why is "Lamar Blvd" in quotes? Would you write "Main Street" like that? It's not the name of a fake or ironic place. I dislike grammar Nazis, but I hate the inappropriate use of scare quotes more. Emphasis on the name related? Irony? On another comment, why would any1 care about the quote? I have a feeling Lamar Smith will be pissed off by that sign, take it as an insult, and order someone to take it down. Just bought my t-shirt. Now I have something to wear when I visit Mr. Smith's office. Being in Austin, I'm ashamed that this man is our representative. At least you have the privilege of voting against him. Really wish I could do that. You could make a contribution to his primary challenger, Sheriff Mack. About the only way you can unseat an incumbent in a Gerrymandered state like Texas is in the primaries. But you'll have to hurry, the primary is next Tuesday. Kind of ironic with Clear Channel right below it ya? I'm hoping Lamar can read, cause he sure hasn't listened! hahaha, that's the attitude, I would have liked to see the Lammar's face the first time he looked out the window and found this. I find it ironic that, by buying a T-shirt, we're contributing to the demise of people who whine "a world without IP requires musicians to just sell T-shirts"
While I applaud the effort, the sign could have accomplished a lot more by simply mentioning Lamar Smith's name. 99% of the people reading this billboard will have no clue what it's about and will not go to the website or do any further research to educate themselves about the topic. 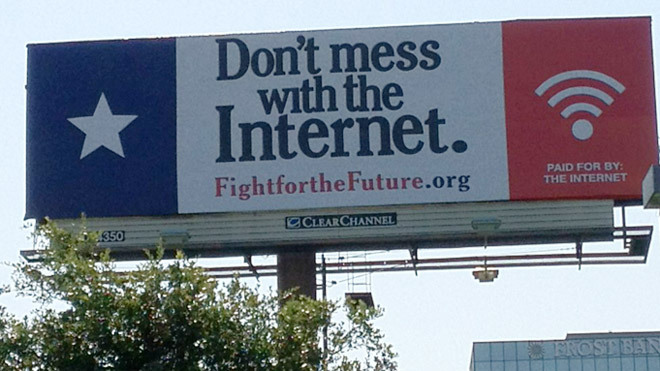 I bet Lamar Smith would be much more concerned and upset by a sign that read, "Don't mess with the Internet, Lamar Smith. We can vote you out." Actually I think 99% of people who see this will know exactly what it's about. It's been a major issue in the primary. Hahaha... $Chan: Still selling out after all these years.